You can choose the font and even the color of each individual letters, but you�ll need a microscope to see them and laser tweezers to move them around. 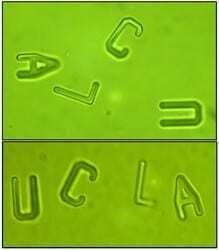 A research team at the University of California in Los Angeles has used a solid polymer to create these �LithoParticles� that could potentially lead to the manufacture of microscale pumps, motors or containers with medical applications. The planned applications of the letters are currently the labeling of cells, either intracellularly or with a linker attaching the letter to the surface of a cell. How about a game of �MicroScrabble�?